Outside the booming city-centres of Canada’s most populous province, many are feeling left behind. With an election looming, increasingly discouraged voters across Ontario are asking: who will bring back the jobs? Toronto, London and Welland, Ont. Construction cranes at a new condominium development in downtown Toronto in May, 2018. On a good day, a 90-minute drive is all that separates two starkly different versions of Ontario’s economy. In Toronto, cranes punctuate the skyline, entrepreneurs raise millions to launch startups, and universities churn out science, math and engineering graduates who are poised to prosper in the jobs of tomorrow. Amazon and Google, tech giants that are synonymous with the knowledge economy, employ scores of workers in the city. A financial centre and government services hub, Toronto is also a magnet for wealth, boasting the second-highest median net worth among major cities, thanks in no small part to a frenzied real estate boom. Roughly 100 kilometres down the road, the Niagara region is stagnant: The same number of people are employed today as a decade ago, and household income has barely budged. Once a haven for blue-collar workers and their young families, the area increasingly resembles a retirement community. More than one-fifth of the St. Catharines-Niagara population is 65 and older, and between 2001 and 2016, its cohort aged 14 and under dropped by 13 per cent. During that time, youth populations rose in areas such as Toronto (7.6 per cent), Guelph (7.5 per cent) and Kitchener-Waterloo (4.8 per cent). Niagara is hardly an outlier. Across much of Southern Ontario, cities and towns are grappling with dimmer economic prospects, slammed by decades of jobs lost to factory closings and their ripple effects. The decline has taken on renewed ferocity over the past 10 years as skyrocketing electricity prices, a volatile exchange rate and foreign competition have hit hard at local employers and surrounding communities. Some sectors, however, are thriving. Since 2000, hundreds of thousands of jobs have been created in such sectors as construction, real estate, finance and professional and technical services – a reflection of both the building boom in desirable urban areas and the tech-heavy tasks that underpin the modern economy. The result is an Ontario that can be roughly divided into its boom and bust towns, where wealth and opportunity either pile up or dissipate. The fault line deepened over the past decade as 90 per cent of new jobs went to Toronto and Ottawa, while incomes in former industrial centres grew at anemic rates or declined. With less than a month until the provincial election, the situation bears an eerie resemblance to that of the United States in 2016, when disillusioned voters in Great Lake states helped propel Donald Trump to the presidency. There is anger in parts of Ontario, too. Against this backdrop, Doug Ford swept to a surprise victory in March to become Leader of Ontario’s Progressive Conservatives. His party leads in the polls, the New Democratic Party is firmly in second and the incumbent Liberals lag in third. 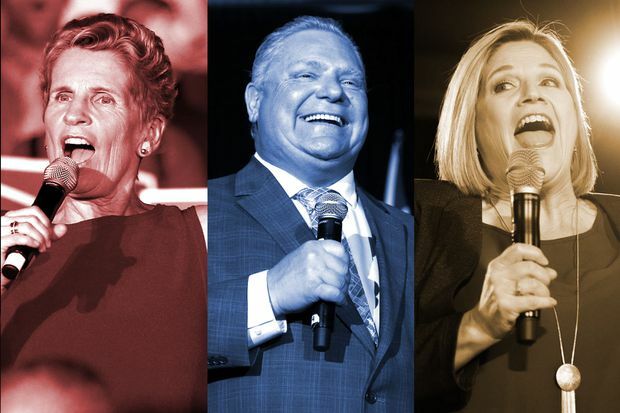 Beset by years-old scandals and meagre popularity for its Leader, Kathleen Wynne, the Liberals face a monumental task: to convince voters they’re better off today than when the party took power nearly 15 years ago. It’s a tall task because, in a broad swath of the province, that simply isn’t the case. Ontario election guide What you need to know before you vote. To offer proof of their economic credentials, Ontario’s Liberals often tout a well-worn stat: growth here is better here than in any Group of Seven country, including Canada as a whole. Indeed, the province has recovered smartly since the financial crisis. Gross domestic product, adjusted for inflation, climbed 2.8 per cent in 2017, following similar gains the previous two years. The province’s jobless rate, at 5.6 per cent, is near its best level in two decades. But the recovery has been uneven. The last census made that abundantly clear. After adjusting for inflation, Ontario’s median household total income increased 3.8 per cent between 2005 and 2015, worst among all provinces and territories. At the metropolitan level, there was a noticeable shakeup in the pecking order. In 2005, Windsor’s median household income slightly trailed that of Hamilton. By 2015, the gap had widened to nearly $10,000. Likewise, London, Ont.’s household income was a tad higher than Kingston’s circa 2005. A decade later, London lagged by more than $6,000. Women’s income is a relative bright spot. Though trailing growth in other provinces, the median income figure in Ontario climbed 11.7 per cent, with most metro areas posting double-digit gains. The rise in women’s income dovetails with another trend: the growth of government jobs. Since 2000, public-sector employment has increased by 40 per cent, nearly double the rate of hiring on the private side, as the government hired thousands of workers in health care and education, two publicly funded sectors that tend to be dominated by women. Thus, it’s not surprising that in places where women’s wages are especially strong, such as Ottawa and Kingston, government work plays an out-sized role in the local economy. But where women have marched ahead, men have noticeably fallen behind. Ontario was the only province or territory where median male income declined over the 10-year period, at minus 2.4 per cent. The figures were particularly bad for male employment income, with the provincial median tumbling 6.7 per cent over the same period, another worst among the provinces. counts those who earned income from labour. The chart shows a selection of Ontario CMAs. The last census showed that male employment income plummeted across the province. income declined from 2005 to 2015 – in some cases, drastically. labour. The chart shows a selection of Ontario CMAs. In all but one census metro area, men’s employment income dropped. The worst declines were found in areas associated with heavy industry, such as St. Catharines, Oshawa and London. Windsor fared the worst, with a whopping 25-per-cent drop over 10 years. Senior officials in Ms. Wynne’s government have conceded that the sobering fall in wages for male workers have weighed down their re-election chances. No doubt, the decline of manufacturing was a major contributor. Over the decade ending mid-2014, the number of Ontarians who worked in manufacturing fell by 365,000, wiping out a significant chunk of the well-paid, union jobs that some communities relied on for generations. By now, the culprits are well known. Automation, global competition and a strong Canadian dollar all factored in the sector’s punishing decline. Manufacturing jobs were wiped out everywhere, including Toronto. But subsequent job growth has been decidedly lopsided. Over the past decade, Ontario has created 580,000 new positions, as measured by the increase in employed people. Metro Toronto, which accounts for less than half of the province’s population, nabbed 80 per cent of those jobs. Ottawa accounts for another 10 per cent. The rest of Ontario, with millions of people from Cornwall to Thunder Bay, accounts for the remaining 10 per cent. In Toronto, job gains have been especially strong in three sectors – finance and real estate, health care and professional services – reflecting both the city’s entrenched position to seize services positions, along with spinoff jobs from the red-hot housing industry. The situation is hardly perfect in Toronto. With pockets of extreme wealth and abject poverty, income inequality has been exacerbated over decades, and overall income growth is uninspiring. But there is little doubt that the country’s largest city attracts and generates an inordinate amount of opportunity. Metro Toronto residents held 48 per cent of the province’s household assets by dollar value in 2016, up from 42 per cent in 1999; blistering home-price growth has made paper millionaires out of many homeowners. The situation is ripe for a populist to rip through the province and attract voters by exploiting the grievances of those who have been left out of the boom. No party leader has pounded the populist drumbeat louder than Mr. Ford. A divisive former Toronto councillor, Mr. Ford’s style of politics and rust-belt support have been compared to Mr. Trump’s. Mr. Ford may be tapping into a deep vein of frustration that snakes through the province. A recent poll, conducted by EKOS Research Associates, ranked residents of different Canadian cities based on how “open” they were in terms of racial tolerance, economic optimism and other factors. It found that the once-prosperous manufacturing centres of Southern Ontario were clustered at the very bottom of the spectrum, indicating deep pessimism and growing intolerance. London is emblematic of the strengths and challenges in Southwestern Ontario. The city has loads going for it, including a lively downtown and the University of Western Ontario. It also has an enviable jobless rate of 5.8 per cent, matching the provincial figure. But London also has more sobering statistics. Once a thriving manufacturing hub, the area’s participation rate – that is, the percentage of people either working or looking for a job – has ebbed to about 61 per cent, compared with 66 per cent in Toronto and 68 per cent in Guelph. Fifteen years ago, London’s rate was nearly 70 per cent. To some degree, that’s a reflection of an aging populace. But labour participation has also noticeably dropped among workers aged 25 to 54. Overall employment, while stronger of late, is roughly equal to where it was in the summer of 2004. The city’s population has grown at a steady clip. New subdivisions have sprung up around the city, with large homes and well-kept lawns, and some residents telecommute to jobs in Toronto or make the trek sporadically. There are crowds of “For Lease” signs along commercial streets in downtown London, and the traffic is light even as rush hour starts. While the city’s economy has begun to improve as Ontario’s economic growth has accelerated, there are still signs of struggle. One thing that has helped save London from the fate of some rust-belt cities is the presence of the local university. A number of trendy cafés in downtown London seem to overflow with some of the 36,000 young adults who study at the University of Western Ontario. A look at Chatham-Kent gives you a clue where the city would be without the university, according to Prof. Moffatt. As with many in his generation, John Hensel has seen work opportunities vanish over the past two decades as plants have shrunk through layoffs, or closed. He’s been among the laid off, and has worked at least nine jobs as an adult. The 48-year-old lives near Chatham-Kent and has seen the region’s falling fortunes. The plant closures started about two decades ago, when he was in his late 20s. “I guess I wasn’t thinking too much about it back then. Now, you can tell that this is a depressed economy. Wages are stuck and the hydro prices aren’t helping anyone,” he said, speaking from his parent’s farm north of Chatham-Kent. Most of the people he went to school with have relocated. His brother moved to Timmins to take a job with a power utility. Mr. Hensel considers himself lucky, but given the opportunity he would have chosen a different course in life. Despite near constant retraining and a wide array of licenses – he’s a welder, millwright and mechanic – finding steady work has been a struggle. For nearly 15 years, he was an experimental mechanic, working on big-rig trucks that would one day be plying North America’s highways. But that factory moved to Mexico. Then he got a job with Ontario Power Generation, but the provincial government moved to close the coal-fired plant where he worked. Six months after he found work at a plastics plant in Sarnia, the company went into receivership. While his skills would earn him a six-figure salary in Alberta’s oil sands, he said he doesn’t want to leave his home. “Family is close here. It’s hard to move. I’m stuck in Chatham-Kent,” he said with a grimace. Since late 2014, Mr. Hensel has found work as a millwright at a nearby automotive plant, but he said he’s worried that it’ll soon close too. He feels like he’s done his part in life, training for new jobs and staying mobile, but he says the government hasn’t done enough for people like him. While his family has voted Liberal in the past, he says he sees the party as too focused on Toronto. While Ms. Wynne has promised cheap tuition, free daycare and free pharmaceuticals for people younger than 25, he says the new spending means little for him. “It’s too late for me. I didn’t get free childcare when I was young and raising a family. I didn’t get the big child-tax credits. They’re giving the free drugs to everyone under 25. The NDP is talking about free dental care too. Everything is free now,” said the father of two. He says the government should focus on not running deficits and reducing its debt. What about Mr. Ford? There’s a long, uneasy silence. However, there’s a resignation, he says, that little will change if Mr. Ford wins. The bureaucracy around the legislature at Queen’s Park is entrenched, and most of the province’s contracts are locked in. “But I’ve decided who I want to vote for,” he said. The most galling aspect of Chatham-Kent’s decline is that there is absolutely nothing unusual about it. On a chilly Saturday night in Welland, for example, the busiest spot in the Niagara town’s largely deserted downtown strip is the Main Street Gaming Centre. About 80 people, many of them grey-haired, sit at long tables inside a brightly lit hall, waiting for a bingo caller to shout out numbers. Two dozen other customers line up for lottery tickets, or stand in front of video betting games, hoping for their own strokes of good fortune. Lorraine Bailey, an 83-year-old retiree, is one of them. Petite and neatly dressed, she’s proud to inform you she’s a lifelong Wellander. But when the conversation turns to the topic of how the city is doing now, the sweet-faced octogenarian suddenly spits fire. Ms. Bailey isn’t exaggerating. A generation ago, Welland was a thriving blue-collar town, where a high school graduate or recent immigrant could count on finding a good job and leading a comfortable life. Bustling factories employed thousands of people. At shift changes, the rush of workers jammed downtown streets. There’s not much need to worry about traffic jams now. Since the early 1980s, a toxic cocktail of globalization and technology has poisoned the local economy. One after another, major employers such as Atlas Steels, Page-Hersey Tubes, John Deere and others have closed or shrunk their local operations. Empty industrial sites now dot the city’s core and a Canadian Tire call centre serves as the city’s biggest employer. So what are Ontario’s former factory towns supposed to do? Most economic development experts stress the need to develop new enterprises by emphasizing education and building links between local schools and nearby businesses. The experts also underline the importance of keeping downtowns vibrant and offering the amenities that can attract professionals and creative entrepreneurs. Welland is an example of how even good strategies can struggle for traction. The city opened a sleek and modern civic square in 2005 to provide a new anchor for the city’s decaying downtown. Meanwhile, Niagara College, with its main campus on the city’s edge, enrolls more than 9,000 full-time students, and offers dozens of programs, from accounting and game-design to viticulture and welding. The lack of obvious economic alternatives has led the city back to its roots. Despite all the prevailing doom and gloom about manufacturing, it’s trying hard to attract new factories. The mayor’s major success has been attracting a new GE plant that will employ 220 workers when it opens this year. What happens if other factories don’t come back? Mr. Campion’s other strategy is to promote Welland as a destination for retirees and long-range commuters to Toronto, a two-hour drive away. His math is accurate. A Toronto house that might sell for $1-million would probably fetch around $400,000 in Welland. The difference in prices reflects the increasingly concentrated nature of Ontario’s prosperity. As factories have declined, more and more of the province’s wealth-making activities, such as finance and technology, are concentrated in a relatively small band of communities with an hour-and-a-half drive of Toronto. The surest way to boost the prosperity of a community outside that charmed circle is to tap the affluence of the nearby metropolis. Nothing demonstrates that phenomenon better than the fireworks that followed the provincial government’s announcement in June that it would extend GO rail service through the Niagara Peninsula to Niagara Falls by 2023. The rail link, if it comes to fruition, would make commuting between Welland and Toronto far easier than it is now. “As soon as they announced it, the frenzy began,” says Gino Villella, a real estate agent in Welland. Prices jumped 30 per cent within a matter of weeks as out-of-town buyers began to bid $50,000 to $100,000 over asking prices in anticipation of a general rise in Niagara real estate. The jump in home prices came as a welcome surprise for local sellers. However, Mr. Villelalla says, it also emphasized the economic gulf between those out-of-town buyers and Wellanders. Ms. Bailey says there’s little to cheer: The city has never been the same since the factories left. She’s not willing to discuss her choice in the upcoming provincial election – “none of them know what they’re doing, as far as I can see” – but she is deeply angry.